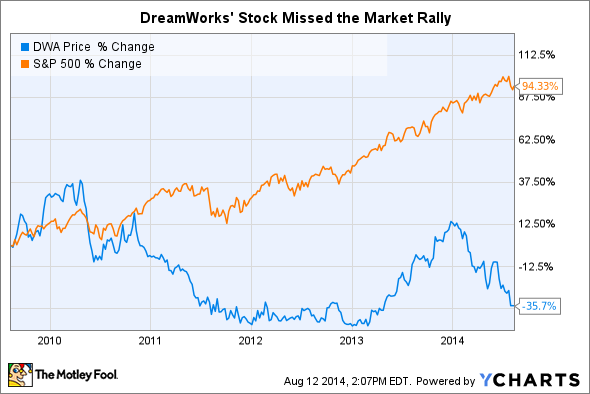 DreamWorks' stock has had a brutal run lately. Here's how that might change. DreamWorks Animation's (NASDAQ:DWA) stock has had a brutal run, dropping significantly over the last one-year, five-year, and 10-year time periods. Investors haven't been impressed as the film developer booked a loss on a major theatrical release in each of the last three years. Cost cuts haven't made up for the box office weakness. Through the first six months of this year, DreamWorks lost $58 million, enough to wipe out all of 2013's profit and make the last three years a complete bust in terms of earnings. However, while there's no telling how the market will react to any particular news, a number of catalysts could send DreamWorks' stock higher over the longer term. Here are three of the biggest. First and foremost, DreamWorks needs a string of wins at the box office. We're not talking just one hit, like The Croods was last year. While that film did well, its results were swamped by the disappointing follow-up performance of Turbo. That's why any DreamWorks' recovery likely will have to start with multiple successive scores in theaters. After Mr. Peabody & Sherman's disappointment earlier this year, How to Train Your Dragon 2 could be the beginning of that run. Already one of the highest-grossing movies of the year, Dragon 2 has a strong shot at racking up even more revenue, particularly abroad. In fact, Wall Street analysts expect DreamWorks to post a 26% jump in third-quarter sales thanks to the success of that one film. Investors have to hope that the next two movies, Penguins of Madagascar in November and Home next spring, see similar results. It's still too early to tell, but the films were well-received at last month's Comic-Con, where DreamWorks teased out some new details and actual footage. The company hasn't made a secret of the fact that it aims to become more like Disney. That is, management wants to "transition DreamWorks Animation into a global branded family entertainment company." That's much easier said than done, as DreamWorks' film business is responsible for 70% of its revenue. That's down from almost 80% in 2011, but still very far from Disney's 15%. However, the company has made some good strides in growing its businesses that aren't tied directly to the box office. That progress includes consumer products sales, which grew last quarter thanks to the Dragon 2 hit. Those sales should also see a boost from a new brand, Felix the Cat, which DreamWorks just purchased and plans to market in the fashion and lifestyle categories. DreamWorks is also growing its television presence, powered by some major content deals with Netflix and other partners that, if you believe management, will help TV-based revenue reach $250 million next year, more than double last year's haul. Once these moves start paying off, investors should reward the stock with a higher valuation, which would reflect the more predictable profit stream that a diverse entertainment business like Disney enjoys. Finally, the establishment of a new hit property, one that can spawn rounds of sequels and secondary business income, could be transformative for DreamWorks. This might be something comparable to Marvel's 2008 Iron Man movie, which changed the way investors viewed the company and helped persuade Disney to spend $4 billion to purchase it. DreamWorks doesn't appear to have any good contenders for a similarly strong franchise in the works, but that's not saying much. We only know about the company's films through next year, which are Home, Kung Fu Panda 3, and a new title called B.O.O. DreamWorks controls a deep library of properties and characters, and it is the job of its creative team to animate them into new, highly valuable franchises. The team has struggled in that regard in recent years, but the potential for a breakout hit is still there. Ultimately, though, investors have placed DreamWorks stock in the penalty box for all the right reasons. The last few years haven't yielded consistent results from its feature films, management's promised cost reductions haven't materialized, and the company's diversification strategy has yet to bear fruit. That's why I wouldn't bet on a real recovery for the stock, at least until DreamWorks reestablishes a track record of consistent success at the box office.